From left: Nicolas Boskis of Owl Master Booking, Julie Burros, Seu Jorge, and Sebastian Fernandez of Owl Master Booking. In case you missed it: Friday was Seu Jorge Day in Boston. It was also Trevor Noah Day in Boston. Apparently, it can be two people’s day at one time. Chief of Arts and Culture Julie Burros presented the honor to Jorge, who had a gig Friday night at the Berklee Performance Center. Jorge tweeted, of the proclamation, “Hoje é meu dia aqui em Boston USA! Obrigado Prefeito Martin J. Walsh por essa honra!,” which roughly translates to “Today is my day here in Boston. 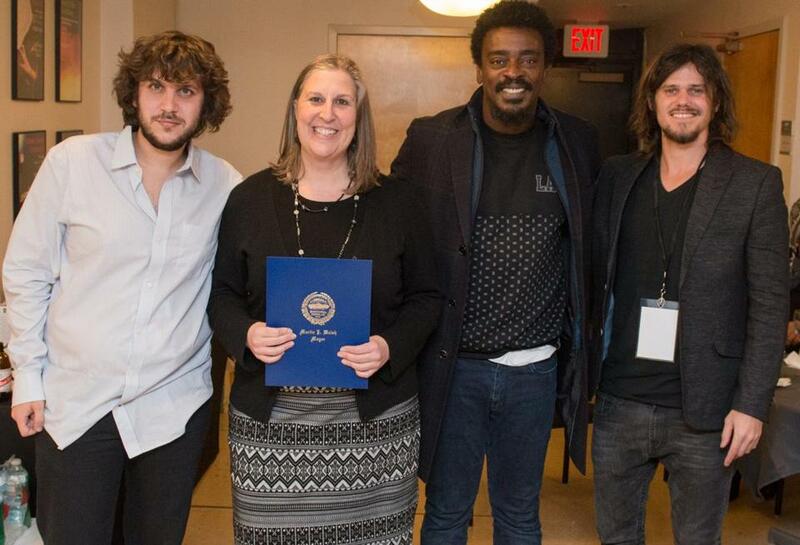 Thank you Mayor Walsh for the honor!” Joining Burros for a photo op were Sebastian Fernandez and Nicolas Boskis, of Owl Master Booking (and the Berklee alumni rock band Stone Giant), which produced the show. Jorge costarred in the Wes Anderson film “The Life Aquatic With Steve Zissou,” which featured his covers of David Bowie songs in Portuguese. The Boston proclamation includes this Bowie quote about Jorge’s work: “Had Seu Jorge not recorded my songs acoustically in Portuguese, I would never have heard this new level of beauty, which he has imbued them with.” Noah, host of “The Daily Show,” received his proclamation from Gabrielle Farrell, of the mayor’s press office. He had shows at the Wilbur Theatre through Sunday.